Unbeaten ONE Women’s Atomweight World Champion Angela Lee moves up in weight in a quest to become the first ever female two-division mixed martial arts World Champion when she battles Chinese powerhouse Xiong Jing Nan, ONE Women’s Strawweight World Champion at ONE: A New Era. ONE Championship in Tokyo Japan on March 31. Lee seeks to rewrite ONE Championship history as the co-main event of the stacked card. At the top of the card, ONE Lightweight World Champion Eduard Folayang will defend his belt in a rematch with Japanese martial arts icon Shinya Aoki. Two-division ONE World Champion Aung La N Sang will defend his middleweight strap against Japanese contender Ken Hasegawa in an epic rematch of their 2018 Bout of the Year, this time on the challenger’s home turf. The card will also see the highly-anticipated debuts of mixed martial arts megastars Eddie Alvarez and Demetrious Johnson, who are competing in ONE’s Lightweight and Flyweight Grand Prix tournaments, respectively. March 31 promises to be the best showcase of world-class martial arts action Tokyo has ever seen in the modern era. 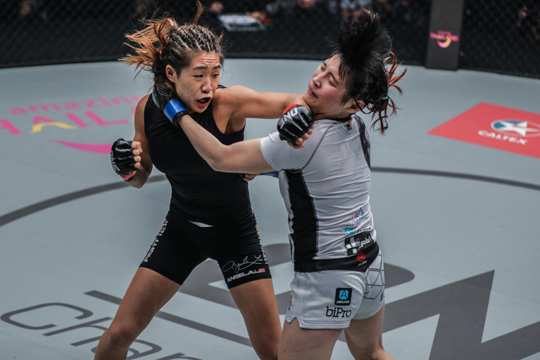 As the face of ONE Championship, the 22-year old Lee is always in the spotlight, and she always seems to keep a positive attitude – whether she is experiencing highs or lows in her career. Even as the undefeated ONE Women’s Atomweight World Champion, Lee has faced insurmountable odds that many could not have overcome. From battling injuries, competing through illness, or coming back from the brink of defeat, she has always found a way to keep her head held high. Winning a second ONE world crown will cement her legacy as one of the greatest MMA fighters in ONE history.